“Don’t Tell Annalise” – The fate of a young client is jeopardized after the Philadelphia Bar Association disciplinary board discovers damaging information about Annalise. 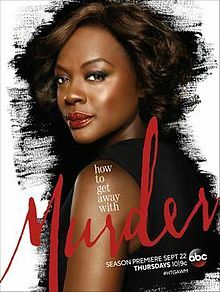 Meanwhile, Frank commits a shocking act that someone close to him must deal with, on “How to Get Away with Murder,” THURSDAY, OCTOBER 13 (10:00-11:00 p.m. EDT), on the ABC Television Network. Guest starring Famke Janssen as Eve. “How to Get Away with Murder” stars Academy Award®-nominee Viola Davis as Professor Annalise Keating, Billy Brown as Detective Nate Lahey, Alfred Enoch as Wes Gibbins, Jack Falahee as Connor Walsh, Aja Naomi King as Michaela Pratt, Matt McGorry as Asher Millstone, Karla Souza as Laurel Castillo, Charlie Weber as Frank Delfino, Liza Weil as Bonnie Winterbottom and Conrad Ricamora as Oliver Hampton. “Don’t Tell Annalise” was written by Erika Green Swafford and was directed by Kevin Rodney Sullivan. “How to Get Away with Murder” is created and executive produced by Pete Nowalk (“Scandal,” “Grey’s Anatomy”). Shonda Rhimes (“Scandal,” “Grey’s Anatomy”), Betsy Beers (“Scandal,” “Grey’s Anatomy”) and Bill D’Elia (“The Crazy Ones,” “Boston Legal”) also serve as executive producers. “How to Get Away with Murder” is produced by ABC Studios. “How to Get Away with Murder” is broadcast in 720 Progressive (720P), ABC’s selected HDTV format, with 5.1-channel surround sound. This program carries a TV-14, D, L, S, V parental guideline.